AkkuFresh® - Do more...with us the fun never ends! Nanotech Battery Life Foil - small business package II. 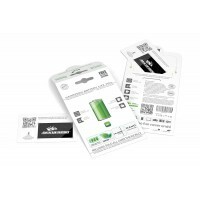 AkkuFresh® Next Generation Nanotech Battery Life Foil - small business package (100 pcs) Package o..
AkkuFresh® Next Generation™ foil is speed-up the charge time, extendeds usable time and slows down the loss of capacity of batteries and thus provides improved battery performance.